A slight new low and then a bounce was expected for Friday. The session did not begin with a slight new low, but price did bounce. Summary: In the short term, expect a bounce to continue to about 2,789; it may be choppy and overlapping and may last another one to few days. Thereafter, another wave down may develop. Intermediate wave (4) has breached an Elliott channel drawn using Elliott’s first technique. 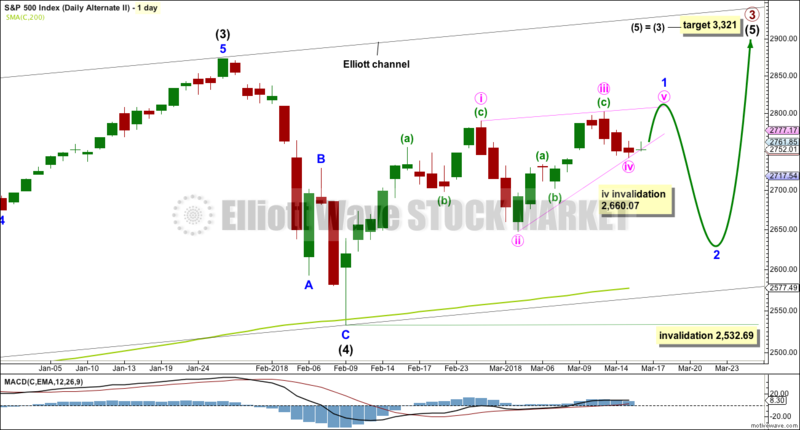 The channel is redrawn using Elliott’s second technique as if intermediate wave (4) was over at the last low. 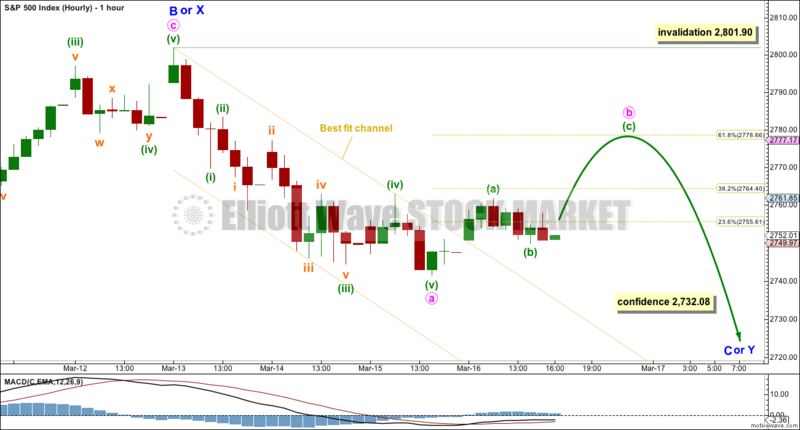 If intermediate wave (4) continues sideways, then the channel may be redrawn when it is over. The upper edge may provide resistance for intermediate wave (5). 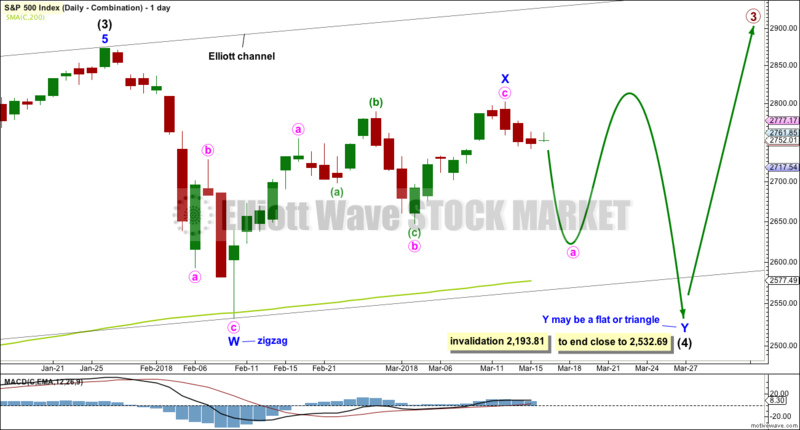 Intermediate wave (4) may not move into intermediate wave (1) price territory below 2,193.81. 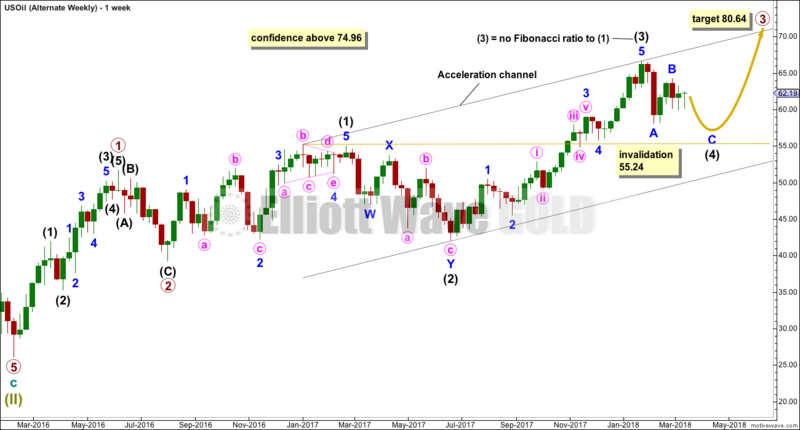 At this stage, it now looks like intermediate wave (4) may be continuing further sideways as a combination, triangle or flat. These three ideas are separated into separate daily charts. All three ideas would see intermediate wave (4) exhibit alternation in structure with the double zigzag of intermediate wave (2). 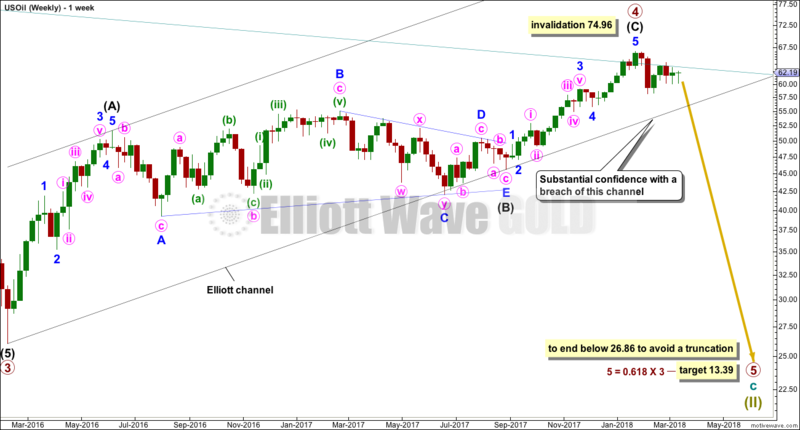 This first daily chart outlines how intermediate wave (4) may now continue further sideways as a contracting or barrier triangle. It is possible that minor wave B within the triangle was over at the last high, which would mean the triangle would be a regular triangle. Minor wave C downwards may now be underway and may be a single or double zigzag. One of the five sub-waves of a triangle is usually a more complicated multiple, and the most common sub-wave to do this is wave C.
Minor wave C may not make a new low below the end of minor wave A at 2,532.69. Intermediate wave 2 lasted 11 weeks. If intermediate wave (4) is incomplete, then it would have so far lasted only six weeks. Triangles tend to be very time consuming structures, so intermediate wave (4) may total a Fibonacci 13 or even 21 weeks at its conclusion. 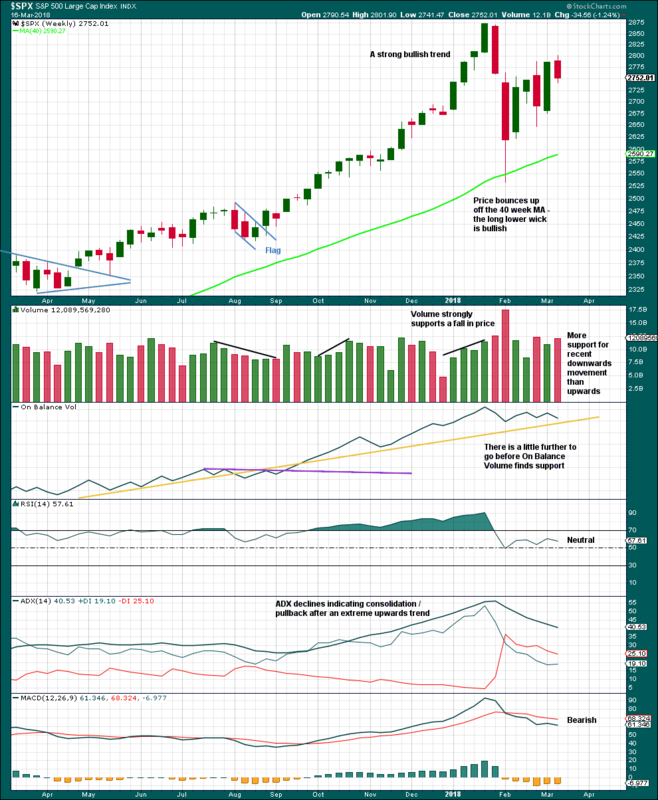 Because this is the only daily chart which expects price to continue to find support at the 200 day moving average, it is presented first; it may have a slightly higher probability than the next two daily charts. The second structure in the double would most likely be a flat correction labelled minor wave Y. It may also be a triangle, but in my experience this is very rare. A flat correction would subdivide 3-3-5. Minute wave a must be a three wave structure, most likely a zigzag. 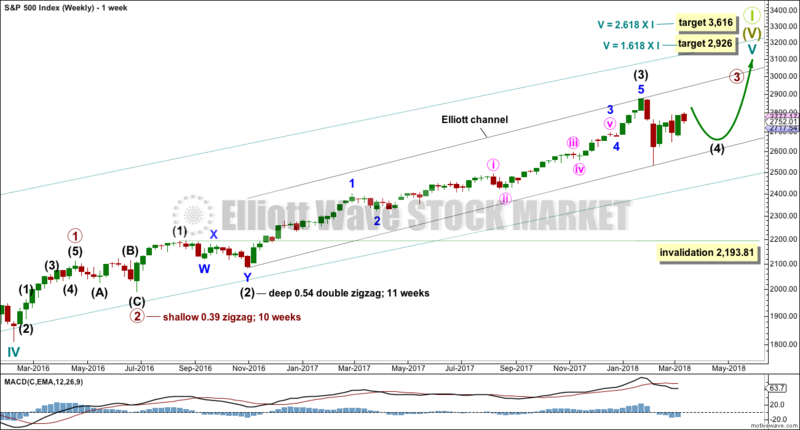 The downwards best fit channel is clearly breached by upwards movement at the start of Friday’s session, indicating the last wave down should be complete and a new wave up should be underway. The last wave down can fit as a five on the hourly and five minute charts. This may be minute wave a of a zigzag. 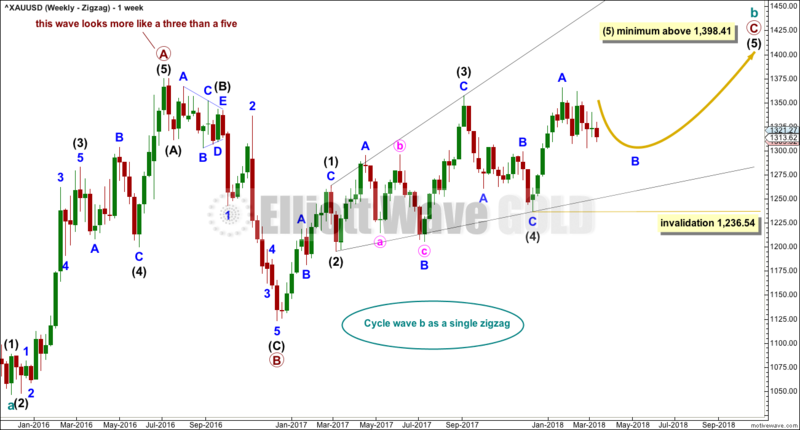 If minute wave a is correctly analysed as a five, then minute wave b may not move beyond its start above 2,801.90. Minute wave b may be any corrective structure. It may be expected to last another one to few days. So far the corrective structure has almost reached the 0.382 Fibonacci ratio of minute wave a, already, so it may continue higher now to end closer to the 0.618 Fibonacci ratio at about 2,779. This wave count would require a very substantial breach of the 200 day moving average for the end of intermediate wave (4). This looks unlikely. It is also possible that upwards movement is not over and minute wave c is incomplete. At this stage, minuette wave (iv) now looks grossly disproportionate to minuette wave (ii), so this wave count no longer has the right look. 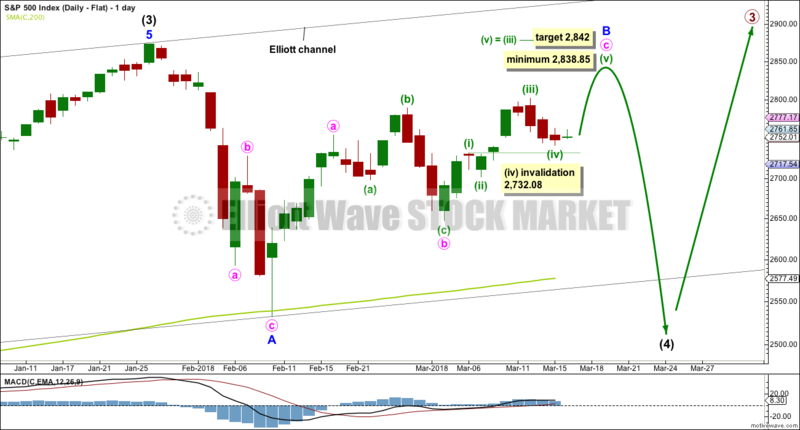 If intermediate wave (4) is unfolding as a flat correction, then within it minor wave B has not yet met the minimum requirement of 0.9 the length of minor wave A at 2,838.85. Within minute wave c, the correction of minuette wave (iv) may not move into minuette wave (i) price territory below 2,732.08. Minuette wave (iv) has breached a channel drawn using Elliott’s first technique, so the channel is redrawn using the second technique. Draw the first trend line from the ends of minuette waves (ii) to (iv), then place a parallel copy on the end of minuette wave (iii). Minuette wave (v) may end either mid way within this channel, or about the upper edge. Friday’s upwards movement is finding support about the lower edge of this channel. A target for minute wave c to end is calculated at minuette degree. This would see the minimum requirement for minor wave B just met. Within minor wave 3, minute wave ii may not move beyond the start of minute wave i below 2,647.32. This first alternate expects minor wave 1 was an impulse. This is the most common structure for a first wave, so this is the more likely of two alternates presented today. It is also possible that minor wave 1 is an incomplete leading contracting diagonal. This is a less common structure for a first wave, so this is the least likely wave count published today. The diagonal would be contracting because minute wave iii is shorter than minute wave i. Within a contracting diagonal, minute wave iv must be shorter than minute wave ii. Therefore, minute wave iv may not be equal or longer in length than minute wave ii, so it may not reach 2,660.07 or below. 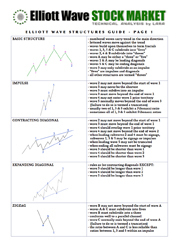 Leading diagonals most often end with a small overshoot of the 1-3 trend line. As soon as price makes a small overshoot here of the upper pink i-iii trend line, if it quickly reverses and moves strongly lower, then this wave count would be indicated as more likely. Leading diagonals in first wave positions are very commonly followed by very deep second wave corrections. If what looks like a diagonal upwards completes and price quickly reverses, then a Fibonacci retracement would be drawn along the length of the diagonal. Minor wave 2 would be expected to be deeper than the 0.618 Fibonacci ratio of minor wave 1. Minor wave 2 may not move beyond the start of minor wave 1 below 2,532.69. 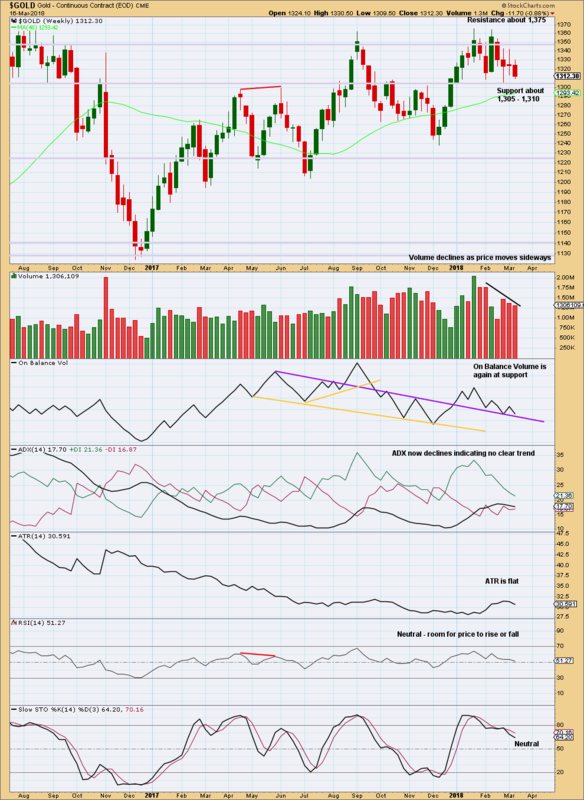 Minor wave 2 may find support about the 200 day moving average. This week moved price higher with a higher high and a higher low, but the candlestick is red and the balance of volume is down. At this time frame, it looks like there may be more support for downwards movement than upwards within the week, but it would be better to look inside the week at daily volume bars to draw a conclusion. 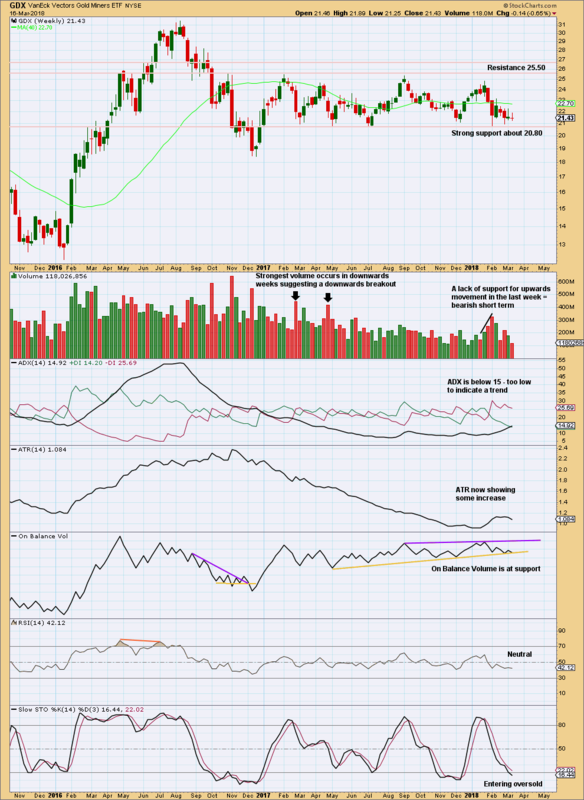 The pullback has brought ADX down from very extreme and RSI down from extremely overbought. There is again room for a new trend to develop. While the small amount of upwards movement on Friday does have support from volume, this was an options expiry date and so a volume spike would be expected. 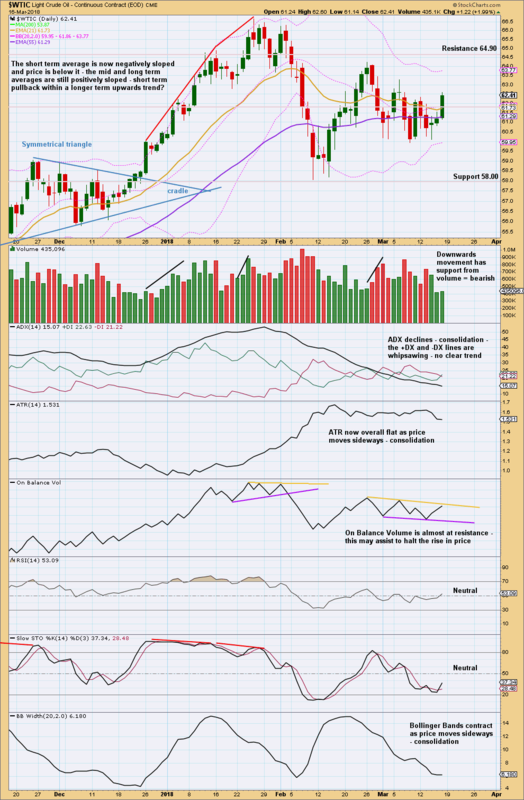 Short term volume is bullish still, but the longer upper wick on Friday’s Gravestone doji is bearish. 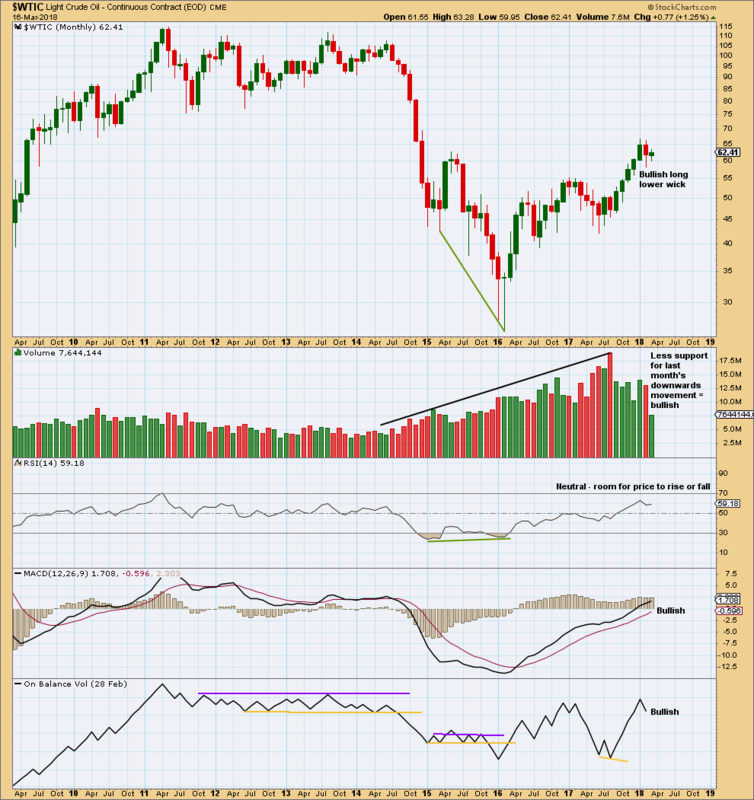 This doji should not be read as a reversal signal though as it does not come at the end of an upwards trend. 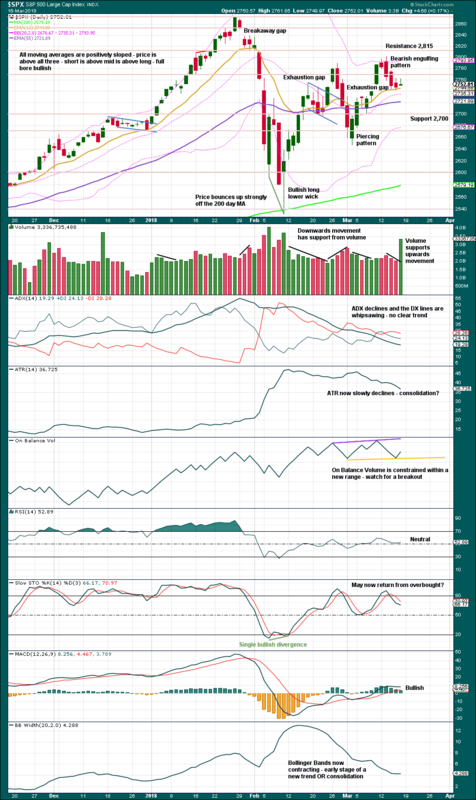 The support line for On Balance Volume is redrawn. 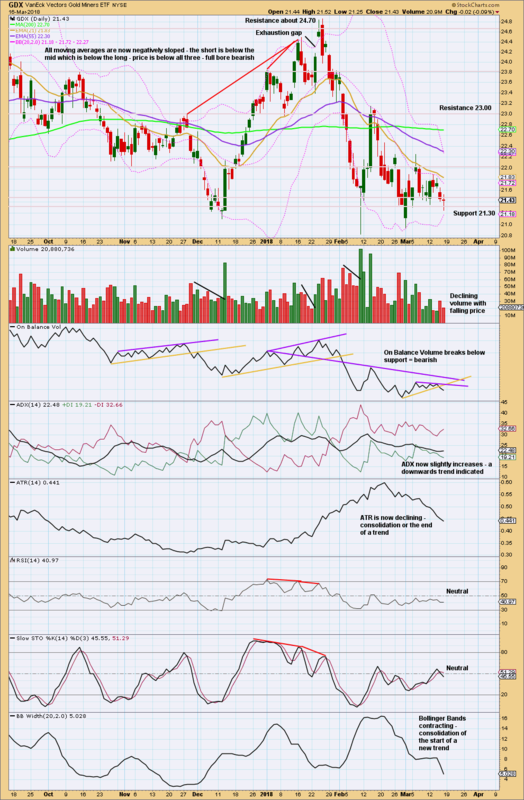 Bullish divergence in last analysis has been followed by an upwards day. This may now be resolved, or it may need another upwards day to resolve it. Inverted VIX on Friday made a new high above the prior high three sessions ago, but price has not. This divergence is bullish. All of small, mid and large caps last week completed an outside week. All sectors of the market at this time appear to be in a consolidation. The AD line on Friday has made a new high above the prior high three sessions ago, but price has not. This divergence is bullish. All indices have made new all time highs as recently as eight weeks ago, confirming the ongoing bull market. Another test of support about 1,310 to 1,305 was expected. This is what has happened. Summary: Expect the upwards swing to resume, which may be choppy and overlapping. 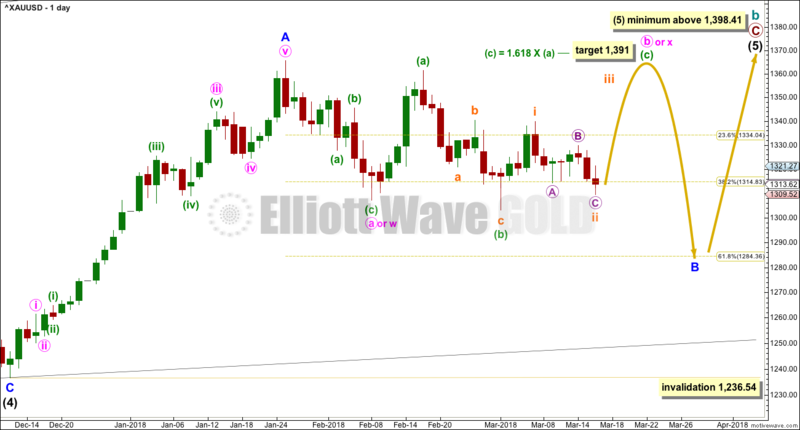 The target at 1,391 may be too high; upwards movement may find strong resistance about 1,365 – 1,375. However, a bearish signal from On Balance Volume at the daily chart level today puts some doubt on this view. 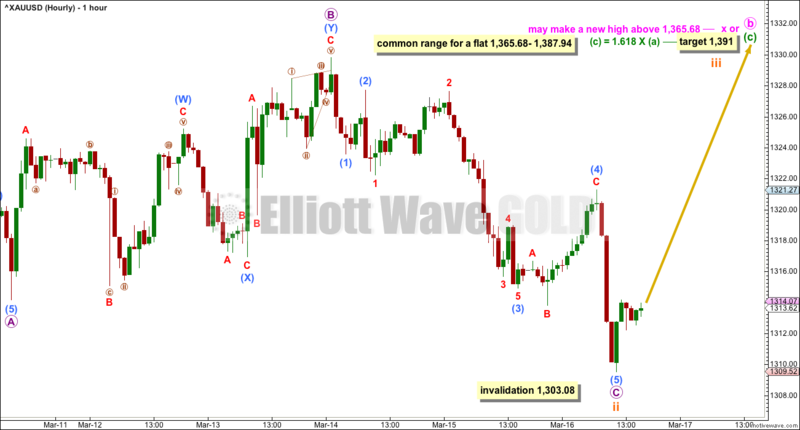 If price can close below support at 1,305, then a downwards breakout may be underway. 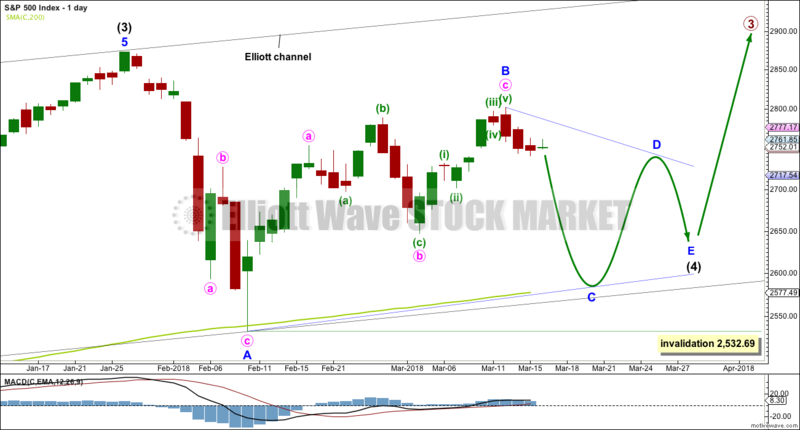 Within intermediate wave (1), minor wave B was a triangle lasting 11 days. 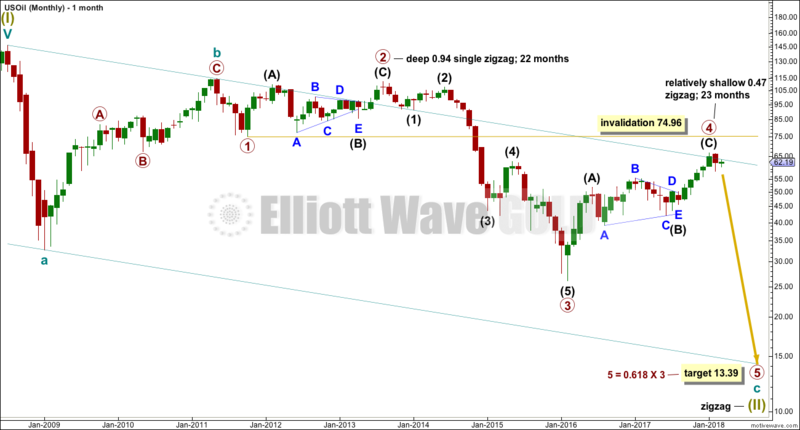 Within intermediate wave (2), minor wave B was a zigzag lasting 2 days. Within intermediate wave (3), minor wave B was a regular flat lasting 60 days. 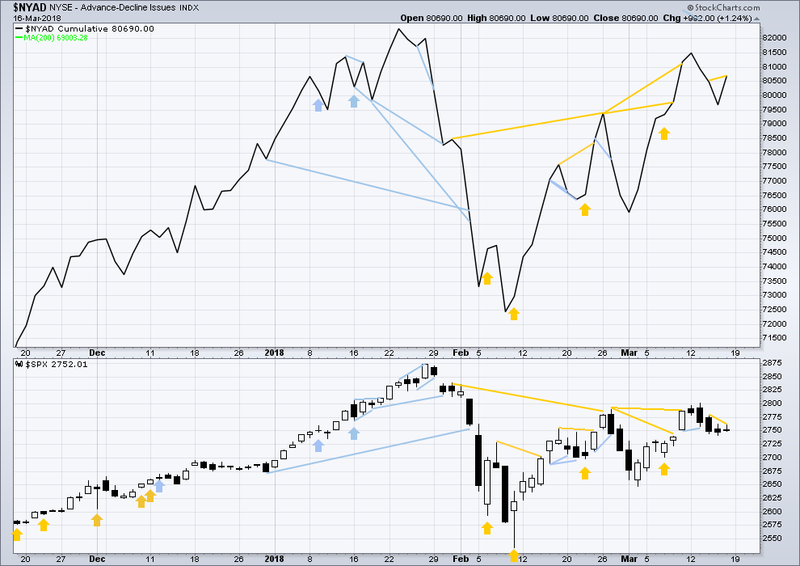 Within intermediate wave (4), minor wave B was a regular contracting triangle lasting 40 days. Within intermediate wave (5), minor wave B may be expected to be an expanded flat, combination or running triangle to exhibit some alternation in structure. It may last as long as 40 to 60 days. So far it has lasted 29 days and the structure is incomplete. Within the ending diagonal, intermediate wave (5) must sub-divide as a zigzag. Minor wave B may now be either a flat or a combination. 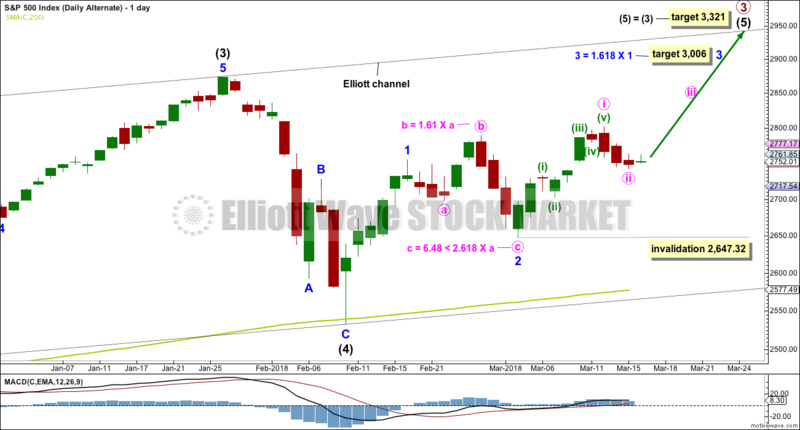 An alternate idea of a triangle for minor wave B is published today in a separate chart below. 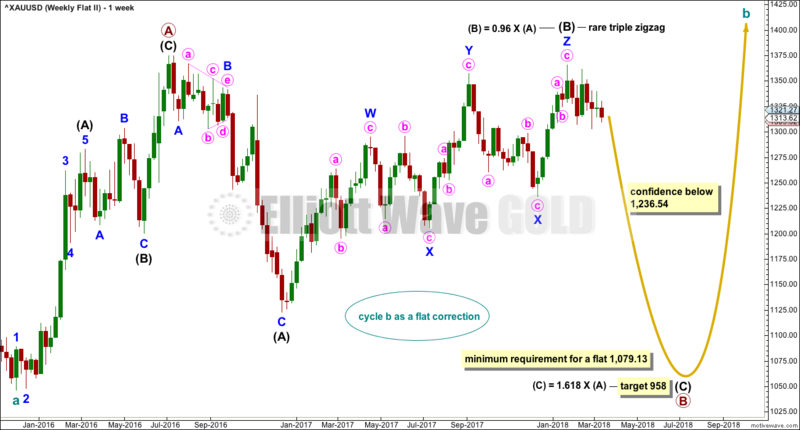 Within either a flat or combination for minor wave B, the correction of minute wave b or x may be unfolding as an expanded flat correction. When this expanded flat is complete, then a downwards swing for minute wave c or y would be expected. Because both options of a flat or combination for minor wave B now expect minute wave b or x to be completing as an expanded flat, they both need to see a five up complete for minuette wave (c). Within the five up, subminuette wave i would be complete at the last small swing high. 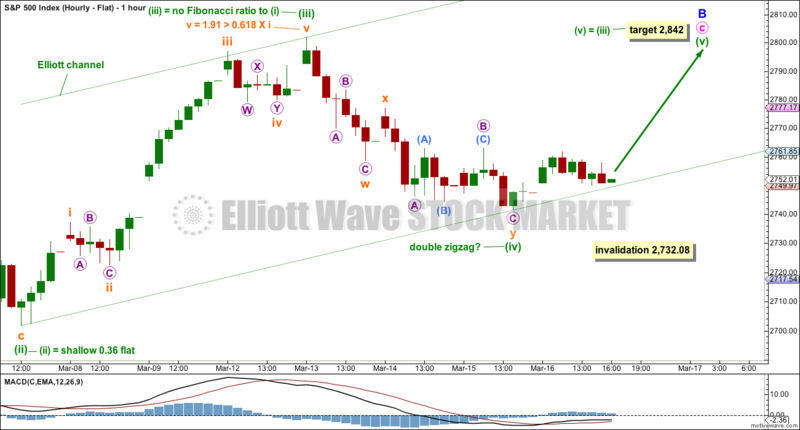 Subminuette wave ii may have ended at Friday’s low. 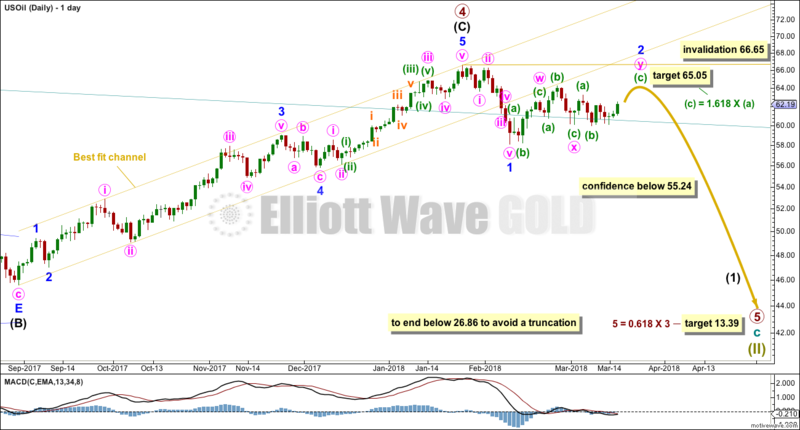 If minor wave B is unfolding as a flat correction, then minute wave c may move reasonably below the low of minute wave a at 1,307.09 and must be a five wave structure. If minor wave B is unfolding as a combination, then minute wave y may be a flat or triangle and may end about the same level as minute wave w at 1,307.09. Subminuette wave ii may now be over. Micro wave C may have bought price back down to test support, which is strong about 1,310 – 1,305. 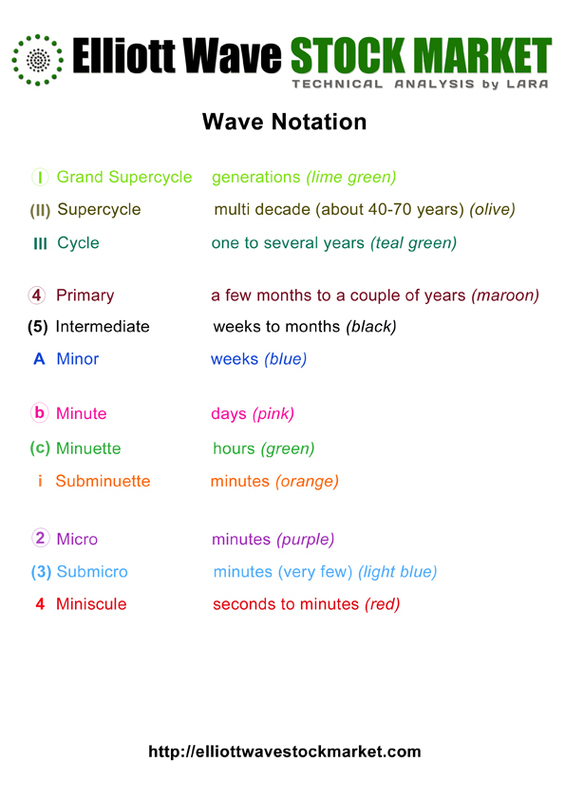 Micro wave C is now a complete five wave structure. Subminuette wave iii may have begun at the end of Friday’s session. 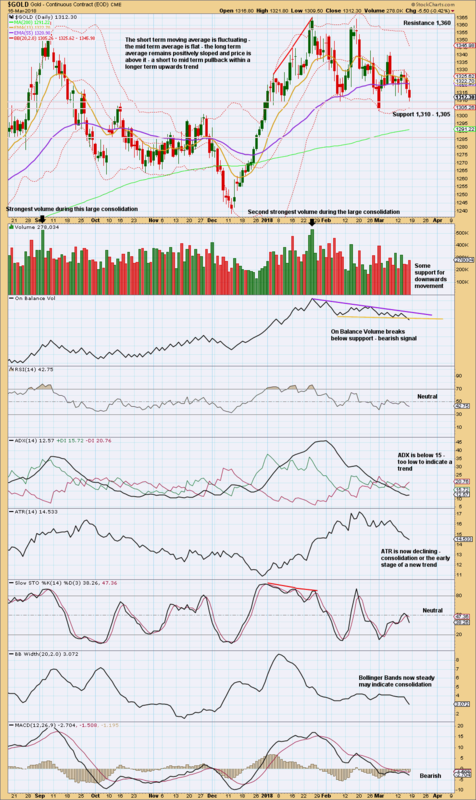 There is a strong Bullish Piercing pattern at the low. 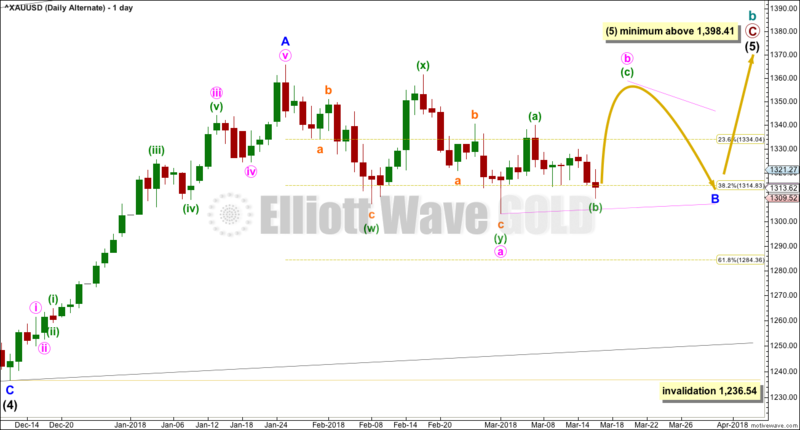 If it continues further, then subminuette wave ii may not move beyond the start of subminuette wave i below 1,303.08. Price is again at support and On Balance Volume is almost at support. With volume continuing to decline, it looks reasonable to expect a turn back to an upwards swing about here. Price is still range bound. Currently, Gold is within a smaller consolidation that began in early January 2018. This consolidation is delineated by support about 1,310 to 1,305 and resistance (final) about 1,375. It is an upwards day during this smaller consolidation that has strongest volume, suggesting an upwards breakout may be more likely here than downwards. With a little support for downwards movement on Friday and a bearish signal from On Balance Volume, price may be ready to break out of this smaller consolidation downwards. This does not support the Elliott wave count. Price needs to close below 1,305, preferably on a strong downwards day, for confidence in a downwards breakout. If there is support from volume, then more confidence may be had (but it is not necessary for a downwards breakout). With On Balance Volume again at support and price close to support, it is reasonable to expect a turn and an upwards swing about here. There is a little room though for a little more downwards movement. 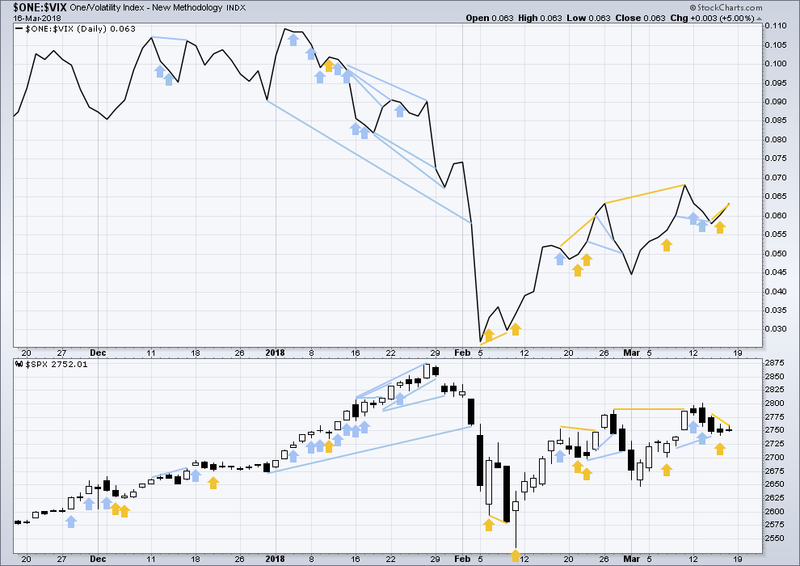 The doji for Friday, coming within a consolidation, cannot be read as a reversal signal. It looks like price may be again finding support close to 21.30. The signal from On Balance Volume is weak because the line has a reasonable slope and is not very long held. It was tested four times though, so this is identified as a weak bearish signal. The signal makes no comment though on how far nor for how long downwards movement may result. While ADX now indicates a downwards trend, for confidence in this a breakout below support with a close below 21.30 would be necessary. If this happens with support from volume, then more confidence in a downwards trend may be had. Another small range week, this time an inside week, does not change the Elliott wave analysis. Summary: The outlook will remain bearish while price remains below 66.65. A new high above 66.65 at this stage would be very bullish. In the short term, still look for a small bounce to end a little above 63.28 with a possible target at 65.05, then the continuation of a downwards trend. Minor wave 2 may still be an incomplete double combination. The first structure in the double may be a complete zigzag labelled minute wave w. The double may be joined by a three in the opposite direction, an expanded flat labelled minute wave x. The second structure in the double may be an incomplete expanded flat labelled minute wave y. At 65.05 minuette wave (c) would reach 1.618 the length of minuette wave (a). When minor wave 2 is finally complete, then minor wave 3 downwards may begin. When minor wave 2 is complete and the start of minor wave 3 is known, then a target for minor wave 3 to end may be calculated. That cannot be done yet. The rise in price had support from volume for the month of January. Downwards movement did not have support from rising volume for the now completed month of February. This is bullish. MACD and On Balance Volume are also both bullish. Overall, this chart is more bullish than bearish. 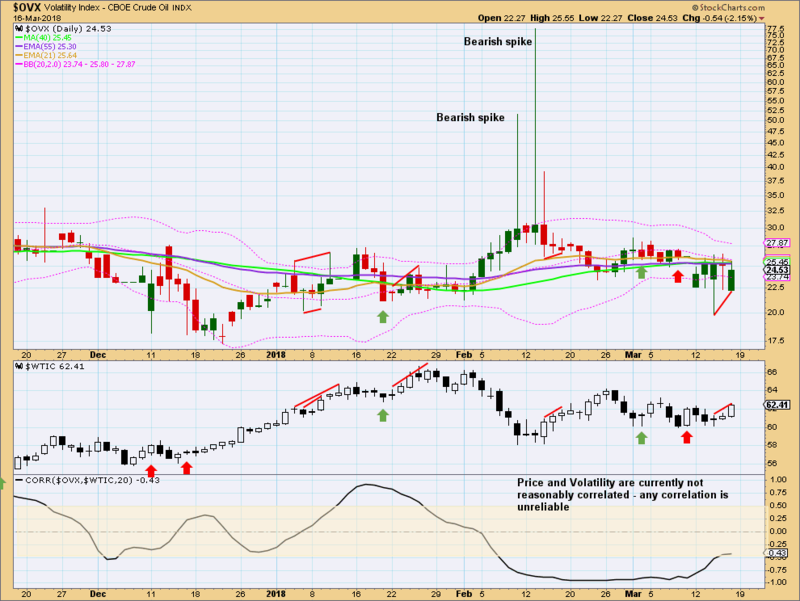 RSI indicates there is room for upwards movement to continue. The pattern of stronger volume for downwards days and weaker volume for upwards days continues. The short term volume profile supports the first Elliott wave count. There is a very small amount of room for On Balance Volume to move higher. Resistance by On Balance Volume may serve to halt the rise in price. Price has made a new high above the prior high three sessions ago, but volatility has not made a corresponding new low. This indicates weakness within price and is interpreted as bearish. 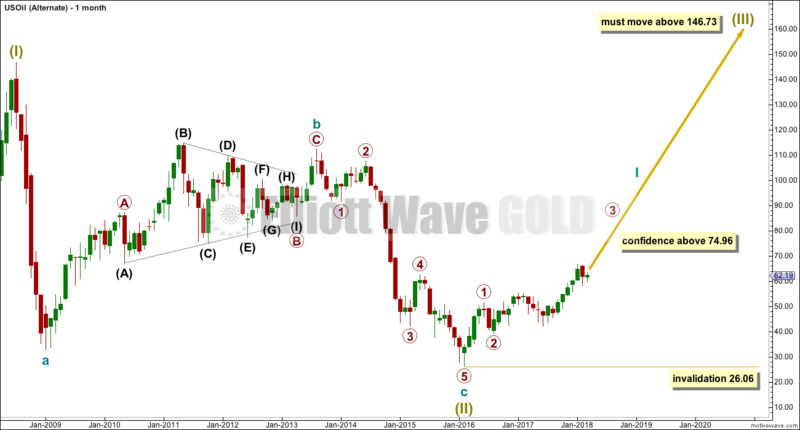 This analysis was previously posted on Elliott Wave Gold.